When Tahlia Newland, an on-and-off blog-buddy of mine, asked me to read and review her collection of magical realism/urban fantasy short stories, there was no way I could refuse, but the truth is I’d have read this collection of six tales no matter who the author was. Taken together, these stories are a collection of different ways to perceive fantasy, and to use fantasy to perceive reality. The collection feels like a complete suite – all moods and tastes are well represented. Taken separately, well, let’s do that, shall we? This one is the darkest in the series, in terms of mood. It involves a woman in a desperate situation being helped by supernatural beings, though the twist at the end is rather grisly. A balance of classic horror and modern terror. With great power comes great responsibility, even when you’re a wizard. The colored light battle had me imagining light sabers (but only a little), but the story about taking ownership of your actions is actually very good. More, please? What if our emotional troughs became literal holes that we fell into? That’s the premise of this story, and Newland envisions it beautifully. It was delicate and delicious. Mind blowing: alternate points of view between a modern woman undergoing chemo and an ancient (fantasy?) world woman about to become a ritual sacrifice – and each are apparently dreaming of the other in a fabulous riff on the old “Am I a man dreaming I am a butterfly, or a butterfly dreaming I am a man” conundrum. I was teary at the end. Easily the lightest tale in the sextet, this story is about an office worker named Sally who discovers a new perspective on her colleagues (and a possible new romance) thanks to a very special pair of glasses. Haven’t we all wished for these at some point? I believe that any fan of fantasy, magical realism, or just a really gripping tale, will find this collection of stories compelling and entertaining, but what really puts the cherry on top is Newland’s explanation of the themes, included at the back of the book. Excellent book group fodder, but perfect for a plane trip, as well. Goes well with hot chocolate and a brownie. 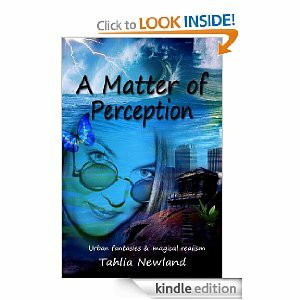 A Matter of Perception, by Tahlia Newland by Melissa Bartell is licensed under a Creative Commons Attribution-NonCommercial-ShareAlike 4.0 International License.